We knew this level 8 team had what it takes to be great! 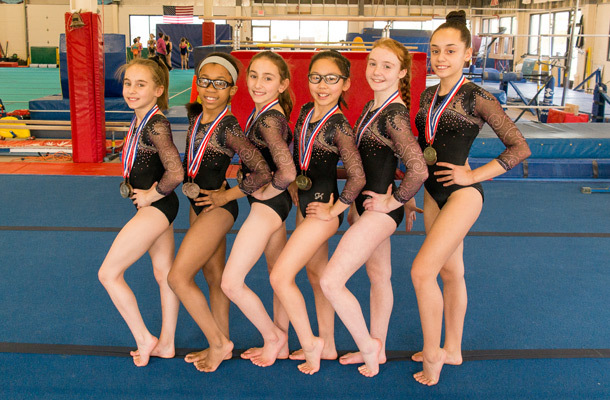 Our 2016 level 8 team is made of Ashlin, Erin, Katie, Porsha, Christina & Summer and each gymnast played a contributing part to tie for 1st place. Katie Song brought home a 1st place on the balance beam and Christina Vargas a 1st place on the vault while the rest of team filled in their scores to bring the team to the top. We are looking forward to a great end of their season with 4 of these 6 girls qualifying to Level 8 Regional Championships on April 2, 2016. Included below are some some photos of the levels 8, 9 & 10 teams. Here’s a link to flickr Don’t forget to bookmark and follow our Flickr site to see all future images & videos we will share. Boys Team Parents & family feel free to download whatever you like, Enjoy!